The system includes a default Supervisor and Administrator account to initially access the application. To log in with the Supervisor account, enter the User name: super, Password: super. This User also has the Administrator Role that allows the User to switch easily between the Administrator and Supervisor interfaces when configuring the system. It is strongly recommended that each User set the Time Zone (in the My Account tab) during their initial login. A default Time Zone can also be configured system-wide by the Administrator within the Setup>Privileges>Customer tab. Use the hyperlinks and buttons within the application screens, in preference to the forward and back browser buttons. This ensures the application maintains control of the session and the data is refreshed appropriately. When using Active Directory for User authentication, the server-side User group definitions and subgroups must be of type ‘Universal Distribution’. The ’Domain User’ group or any other security group cannot be added to any User group. For more information about working with directory servers, see Active Directory Integration within the Administrator Guide. If Billing is to be used to manage Contracts, it is recommended that this be enabled before other configuration is set, to prevent system disruptions. Before you begin to populate the database and use the system, it is important to note that records for Customers, Technicians, Items, Item Types and Knowledge Base Categories or Articles are only disabled within the application when the Delete option is selected. The records are not deleted from the database. This preserves the integrity of your data whilst maintaining audit trails, should they ever be required. It is strongly advised that records are not manually deleted from the database as this may invalidate existing relationships in the application, and cause the system to crash. Active Directory is a unique implementation of the LDAP standard, as the requirements for communication need to conform to the Microsoft™ Windows Authentication protocols. To meet this need, it is necessary to enter all domains from which Users will authenticate. Multiple sources of Active Directory can be synchronized with the system, if required. The LDAP/Active Directory Server screen tab is displayed. Domains will need to be entered in both NT and Windows 2000 domain naming systems formats. This is because Active Directory conforms to Microsoft™, Windows NT and Windows 2000 authentication protocols. Make entries with care, as they are not validated against the Directory Server by the system Domain Editor. To import LDAP Groups, select Import Groups and specify Group Admin DN, Password and Group Node/Base DN. where the system expects to find the User Groups. Determines how the integration layer will authenticate. For Active Directory this should be set to Cleartext– Username + Password. Anonymous connections to Active Directory are rarely enabled. Enter the hostname or IP address of the Active Directory Server. On a Windows NT domain this will be the primary domain controller. The default Active Directory Server Port is 389. This is rarely changed. Used by the system to authenticate against the Active Directory Server when reading account information. The domain prefix/suffix will be appended, based on the default domain, when connecting to the Server. Enter the Password for the Username account. Groups must be in the default domain, in this case myoffice.mycompany.com. The Users Node only needs the location of the Groups within the default domain, so the Users Node in this example will be: ou=UserGroups, ou=MIS. Group Admin DN: Specify the group admin DN. Password: Specify the password of the DN. Group Node/Group Based DN: If this field is not specified, then it considers the value specified in Users Node/Base DN. NOTE:The above options are enabled only when you select Import Groups check-box in the Groups section. Select the default Timezone to be applied to all User accounts imported via Active Directory. Repeat the above process to add more than one authentication server for authorizing User access. The Test button creates a connection to the Active Directory Server, applying the configuration settings. If successful, it will attempt to determine how many Users are in each group and display a Results Screen. NOTE:If the test fails, an error message will display the cause. The Sync button runs the synchronization process to import all Users from the Server Directory. If new Active Directory Accounts have been created and those Users require immediate access to the system, a manual synchronization would be used. Only one synchronization can run at a time. When multiple Users need access, create the accounts, then run a single manual synchronization. A manual synchronization may take some time as it depends on the connection speed with the external service. The manual synchronization works best for small directories. Larger Active Directory implementations can take some time to propagate the changes, so account information may not be immediately available. Customer details can be imported using Active Directory by enabling the option, if required. When the system is setup to synchronize with Active Directory, move to the Setup>Privileges>Customer tab and enable the Include Customers option. If there is a need to create Customers using Active Directory and the system's internal authentication capability, Mixed Mode authentication can also be enabled. After the option to Include Customers is set to Yes in the Customer Privilege tab, the Mixed Mode field is displayed. Set this option to Yes to allow Customers to be created directly in the system and using Active Directory. Accounts imported from Active Directory use the UPN as the Username, as opposed to the NT style login. The domain component of the UPN is derived from the selected domain in the popup on the login page, which means Users need to enter their login name only to connect to the support application. Login details are passed directly to the directory server for authentication and are not retained within the service management system. Before setting up the LDAP/ADS configuration within the system, the Advanced settings should be revised. The default setup assumes that the User Groups that the system uses to authenticate match what is on the server, and that the User information imported matches the attributes available on the server. The LDAP /Active Directory Setup screen appears. Sets a routine synchronization to update the system with current AD/LDAP accounts. Select the required Daily, Weekly or Monthly intervals and Commencement details. Set the day of the week and time the system is to start automatically synchronizing with the directory server. The User Group names can be customized, only requiring a unique name for each group. The group names on the Directory Server must be identical to the User Group names entered here. Customize or use the default User Group names as necessary. Members of each group will be assigned the appropriate Role within the system. To assign multiple Roles to a User, make sure they are members of each of the required groups. Users can have only one of the Supervisor, Technician or Partner Roles but they can also have any other Role or combination of Roles. Maps attributes from the directory server to corresponding fields in the system. Native system fields are First Name, Last Name, Email (A unique Email Address must be included for a User account to be created), Phone, Mobile, Pager, Address, City, Zip and Country. NOTE:Mandatory User information for new and existing User accounts include the First Name, Last Name and Email address. If these details are not available, the application will not validate an existing User account and automatically reassign any open or active requests to another valid User. Standard:Next to each field is a drop-down menu containing the list of default fields specific to either LDAP or ActiveDirectory server type. For each native name, the default fields are selected. Use the default mapping or select the mapping attribute as required. Custom: Select the Custom option to manually enter an Attribute Field. The LDAP User field headings will be replaced with any custom LDAP/ADS Accounts fields created by the Administrator in Setup>Custom Fields ( See Custom Fields. ), or Mixed Mode User Fields if the Mixed Mode option is enabled in the Server tab. Use the drop-down list to select the appropriate mapping to the matching directory server field or select Custom to manually enter a Field. Organizational Unit relationships can also be mapped from the authentication server. By default this is not enabled. To activate Customer Organizational Unit mapping, select Yes for the Import Customer Organizational Units option and define where the Company and Department information is to be derived. LDAP attribute that defines a Customer's line manager, which is used for processing approvals on Service and Change Requests. Only system users with the Customer Role can be assigned as Line Managers. The LDAP User field headings will be replaced with any custom LDAP/ADS fields created by the Administrator in Setup>Custom Fields. See Custom Fields. Use the drop-down list to select the appropriate mapping to the matching directory server field or select Custom to manually enter a Field. User details are imported when synchronization with the Active Directory/LDAP server takes place. Imported fields cannot be modified through the service management tool directly, the appropriate authentication server console must be used. Organizational Unit relationships can also be mapped from the authentication server. By default this is not enabled. To activate Customer Organizational Unit mapping, select Yes for the Import Customer Organizational Units option. NOTE:The details of the Org. Units are not populated upon this synch, only the Org. Unit names. For the Org. Unit details to be assigned to Customer or User Information, create the Org. Unit in the Supervisor>User>Organizational Units tab and ensure the Org. Unit name is identical to what is stored in the authentication server. If the details are not identical, the system will create another Org. Unit. The Billing module allows Users to create Invoices, Purchase Orders and manage Customer support Contracts. Billing allows support organizations to charge Customers for support services provided, and manage Items purchased with Service Contracts. 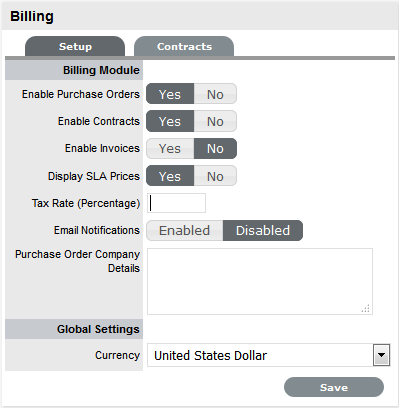 When the Billing module is enabled by the system administrator, the Invoices and Purchase Orders sub-menu options are available within the application Finance tab. Purchase orders can simplify the tracking of where and when new Items are purchased or leased. This feature is not meant to replace an organization's original PO system, it is designed to easily link a specific PO number (and its associated vendor and date information) with an Item. The Invoices section allows Customers to be billed for products (Items) or support services (Contracts) provided by the organization. An Invoice can be created when an Item and Service Contract is ordered by a Customer. Alternatively, Invoices can be created for Service Contracts alone, as the Item may already exist in the system. When an Item, Customer or Organizational Unit is created, or edited to assign a new SLA. Allow Users to track Items from the moment an order is placed to its delivery and implementation. POs cover leased and purchased Items. 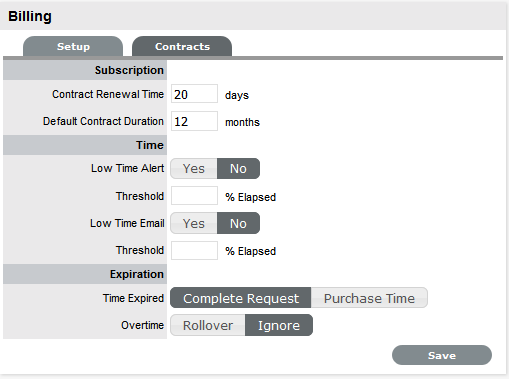 Within Contracts, Users can manage Customer Service agreements over a specific time period. 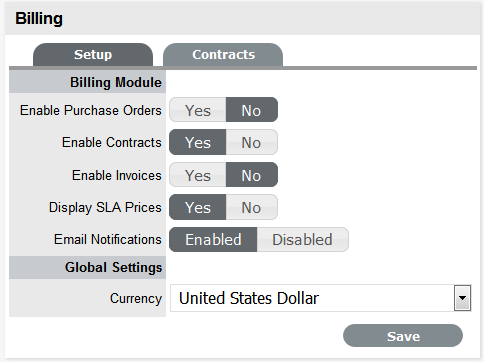 Enables SLA Price fields to be visible in the SLA Editor screen. This allows the Supervisor to allocate costs to SLAs and assists with the calculation of Break Even Point costs for Service Items. Enables the system to update Finance Users via automated emails, regarding Invoice and/or Contract related matters. Defines the currency that is to be automatically applied by the system for all financial transactions. NOTE:Invoices and Contracts will not work when Global Items are in use. If Billing is enabled after the application has been in use, a Supervisor will need to assign owners to Global Items before Billing can be activated. Purchase Orders can simplify the tracking of where and when new Items are purchased or leased. This feature is not meant to replace an organization's original PO system, it is designed to easily link a specific PO number (and its associated vendor and date information) with an Item. The percentage amount entered here is applied by default to all POs. The Purchase Order sub-menu option is made available within the Finance tab for Finance, Supervisor and Technician Users, when enabled. A Contract is made up of a Service Level Agreement (SLA) and a Service Delivery Period (start and end time). They can be used to manage an entitlement to service from a start date, through to an end date. 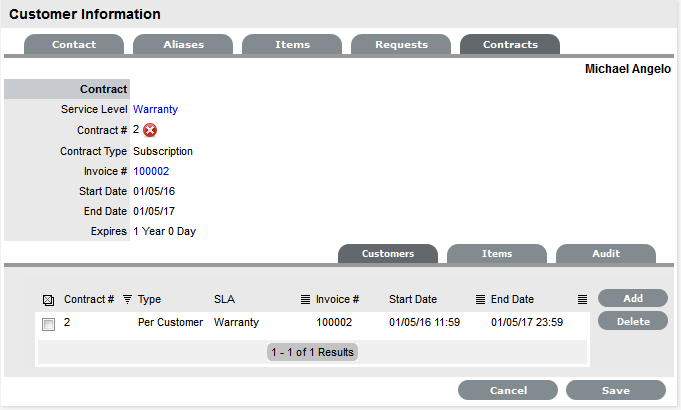 Contracts and Invoices are used together when the Service Desk needs to charge its Customers for any support provided. Billing within the system is on a per Contract basis, and is enabled automatically when Invoices are activated. Pending Contracts are contracts that have a start date set in the future. They automatically become active on the contract start date or can be enabled manually. A Contracts tab will be visible. When enabled, automated emails are sent to Finance Users regarding matters relating to POs, Invoices and/or Contracts. The system can automatically send a Contract Renewal Invoice before a contract expires. Enter the number of days prior to the contract expiration date for the system to send the renewal invoice. For Contracts not to be automatically created, leave this field blank. The system sets the default contract renewal period to 12 months, adjust or delete the entry as required. The system can automatically create an alert within the Customer Portal for customers that have Time-based contracts (i.e., purchased a quantity of support hours.) The Alert can be sent based on the percentage of hours that have been used. The system can automatically send an email to a Customer that is getting close to using all their support hours in their Time-based contracts. The Email can be sent based on the percentage of hours that have been used. The Email content is set in the ContractTimeLow option of Setup>Email>Templates. When a Customer's contract is expired when a User is working on a request, this option specifies if the User can Complete the request although the Contract has expired and if the system will lock out the User until the Customer has purchased additional time. Rollover - means the time used to resolve the issue will be subtracted from the Customer's renewed contract. Ignore - means the time used to resolve the issue, although the Customer contract has expired, is not allocated to a future contract. These configuration steps are recommended as a guide to assist with customizing the application to suit the service environment. These steps are what is required at a minimum to enable your system. It should be noted that these steps require access to the Administrator and Supervisor views. The following procedure covers editing the logged in User account details and ensuring this User has all the relevant privileges to achieve what is required to configure the system. It then details the steps to enable the system to work with Email, setting the privileges for how Customers and Technicians can interact with the system, and how requests and the system will behave. This is defined within the Setup>Privileges tabs. The User then has the option to customize the look and feel of the system, although this can be done later, if preferred. The next step is to create Customers and Users in the system. Moving to the Supervisor Role, the User then configures the day-to-day elements within the application, which are part of creating and managing requests. This includes setting the timeframes for managing requests and defining trigger points for escalations by configuring SLAs; detailing the steps a request will move through, by customizing Workflows, which includes setting the stages of the Workflow where timers will trigger automatic warnings and escalations; defining the Team(s) of Technicians who will be associated with the customized Workflows and SLAs. With the basic elements in the system now in place, the User then moves to the Configuration tab to customize the Configuration Management Database (CMDB). This part is often considered the most complex part of configuring the system, as this is where the service environment, including physical and service Items, is mapped into the system with associated relationships. When designing the CMDB, first the templates for all the different Item Categories are created. These are refined as Item Type templates, with these two templates used to define the information recorded against each Item and classification of issues that can be associated with each Item when requests are logged by Customers. After the CMDB structure is defined, Items are imported via AMIE or .csv file. This is when the Items are associated with Customers or Organizational Units, who can log requests against the assigned Items. This step allows the system to manage requests via email. After completing the information in the Server and Setup tabs, the content for automated emails sent by this system can be customized. This does not have to be all done at this point, however, it is suggested that within the last page of the Templates tab, the Signature be updated to reflect the service organization name. At this stage, it is suggested that each option be reviewed in theUser, Customer,Request and System tabs within the Privileges sub-menu option. Although it should be noted, these can be adjusted in the future. If you are unsure about what an option refers to, select the Help button on the system UI, to display the relevant page of the User Guide. Be sure to set the appropriate Time Zone within the Customers Privilege tab, as this needs to be set before importing Customers and Users via an authentication server to ensure it is set correctly on all newly created accounts. This can be done now if the images are available. Alternatively, return to this step at a later stage. Note, to associate Organizational Unit information with Customers or Users, this can be configured at this point within the Supervisor>User>Organizational Unit tab. Should the import include the name of the Org Unit that matches what is recorded in the system, the details from the information recorded internally will be applied to the Customer or User. Move to the Supervisor view by clicking the User link, next to the logged in User Name. If these are unknown at this time, the system includes a default SLA that can be used. This is more than likely an advanced system configuration step at this point, or may not be relevant to the service organization. However, if OLAs or UCs are in place in the service organization, they can be mapped into the system now. Alternatively, they may be added later. The system includes default Workflows across all Processes. At this point, the default Workflows may be sufficient, or they can be customized to suit the service organization requirements. Alternatively, new Workflows can be created from scratch. By default the system includes one Process Team and the Unknown Team. Edit the existing Process Team, including defining the way it works, assigning the relevant Technicians, associating the Workflows that the Team will support, and setting the Technicians to work in the appropriate Escalation Layer(s). Teams are to be created for all Processes that are to be managed by the system (i.e., Incident, Problem, Change, Service Request. ), although it may be relevant to finish one Process first, and return to do the other Processes at a later date. These settings will be applied to all newly created Items and Item Types that result from an AMIE import. Return to the Supervisor view by clicking the User link, next to the logged in User Name. The system includes a number of default Categories, which should be more than enough for most organizations. Within the Category, the attributes of an Item that are to be recorded in the system, are defined by customizing the field labels. The stages that an Item can move through in its lifecycle are defined within the Life Cycle tab (i.e., Installed>Pending Configuration>Pending Test,etc). The types of issues reported against an Item are then created in the Classifications tab. For service organizations wanting to fast-track the capability to manage requests in the system, it is advised to create Service Items in theService Catalog to allow Customers and Technicians to log and manage requests within the application. Create a Type using the Service Category for each Service being offered, then create the Service Item with the newly created Type template. For the Service to be available in the Catalog, be sure the Service Item status is set to an Active, non Pre-production State. If the Customers are to access a Service on the Customer Portal, the Service Item Lifecycle State should also be set to Customer Visible. If the Types are not to be automatically created as part of an AMIE or .csv import, this is done in the Configuration>Types tab. This is where the Category template is associated with the Type template, the default Teams and SLA are set, and the Classifications for issues reported against Items are refined. If Items are to be imported via a .csv file or AMIE proceed to Step 14. 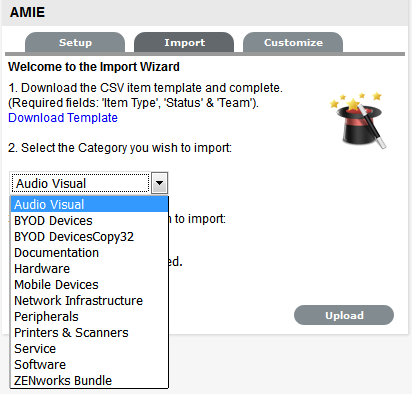 Within the Admin>Setup tab, complete the Item Import (See: AMIE Import or CSV Import). If Items are to be created directly within the system, this is completed in the Configuration>Items tab. An Item Type template is selected for the new Item, which applies all the default information set within the Categories and Types tabs, then ownership of the Item is assigned to the new Item. Ownership can be Everyone (i.e., a Global Item), one or more specific Customers or Organizational Units. The specific attributes of the Item are recorded in the Details tab, and any relationships with other Items in the system can be created within the Relationships tab, now or at some point in the future. The Email Setup tab allows the Administrator to define the behavior of the email polling functionality. Enable Email Polling to allow the application to check for new email received in the mailbox on the incoming server defined within the Server tab. For new messages that are received, the system will send a message to the sender acknowledging their message. System generated messages are customized within the Setup>Email>Templates tab. NOTE:This option will be locked down if the Create via Email option is selected. Enter the time period the system will use to check the incoming server for any messages sent to the support system. Select Yes to include a banner within emails sent from the system. The banner will be derived from: Setup>Customize>Setup>Public Banner. When enabled, details of any system errors occurring while the application is running will be sent to the development lab. For emails sent within requests, define if the Technician is to be copied or blind copied the correspondence. NOTE:Email Polling will be locked down to Yes when this option is selected and the Accept Anonymous option is displayed. When enabled, and if there is more than one Team created for a Process, within the Summary tab of a request the Alternate Team field is displayed. Members of the Alternate Team will be notified relative to the settings defined for the Current Team, and for New Notes, if Technicians is selected in the New Notes screen. When set to Yes, new Notes created by a Technician or Customer are also sent to them when they save the Note. When enabled, the system will include the request Status within the Email Subject line of any correspondence sent from the system, regarding a request. When enabled, the system will include the request Priority within the Email Subject line of any correspondence sent from the system, regarding a request. When enabled, the system will include the content from the Subject line of a request within the Email Subject line of any correspondence sent from the system, regarding a request. The Instance prefix is used to process email correspondence from multiple instances. If this is not required, set the option to No. Within the new Notes editor of requests, the default email settings can be defined for the recipient groups. Define the groups who are more likely to be sent every New Note created related to a request. Set the default language file to be used for email correspondence. The option set is applied to the Email Locale field in the Customer and User Information screens and can adjusted on a per account basis, as required. NOTE:The content for automated emails sent from the system for languages other than English, is defined within the Localization>Content tab. When the Accept Anonymous option is enabled, the system will create requests from emails received from email addresses not recorded in the application. This process is managed by the System User being assigned as the Customer, and the original sender being added to the email address list, in the Notify section. It should be noted, that enabling this option increases the likelihood of spam emails being converted into unwanted requests in the system. Email administrators should ensure that spam filtering is performed prior to the request being received in the inbox polled by the application. It is not the function of the service management tool to monitor, parse or filter emails prior to the creation of records based on the contents of the target inbox. The System Privileges tab is displayed. To be completed with details of the machine hosting the application, if required. Allows users to edit the identification number of an Item. Allows access to the Public Knowledge Base on the Login Page. Provides access to Public Surveys on the Login Page. Alerts with the visibility defined as "Everyone" will be made available on the Login Page. Random: the system will generate a random string whenever a password is reset. Email: The Users Email Address will be used as the password. Manual: Allows the User to manually create a password. Enables the ability to set security questions within the My Account screen for Customers and Users, which are referenced when resetting or re-sending login credentials. The number of minutes the system waits before terminating idle sessions. NOTE:Ensure that the session timeout on the server hosting the application, is equal to or greater than the Timeout option defined in the System Privileges. When enabled, if a User attempts to log into the system when they already have an active session, they will be prompted to end the active session to allow for the new login. Select the order for names being displayed in the system, when the First and Last Name are shown together on a screen. Enables the system to function as an OpenID Provider for User authentication across network resources, as the user authentication source. The Protocol should be set to http or https and the server details should include where the system is hosted. Enables the system to delegate authentication of Users and/or Customers to one or more OpenID Providers (i.e., Google, Yahoo). 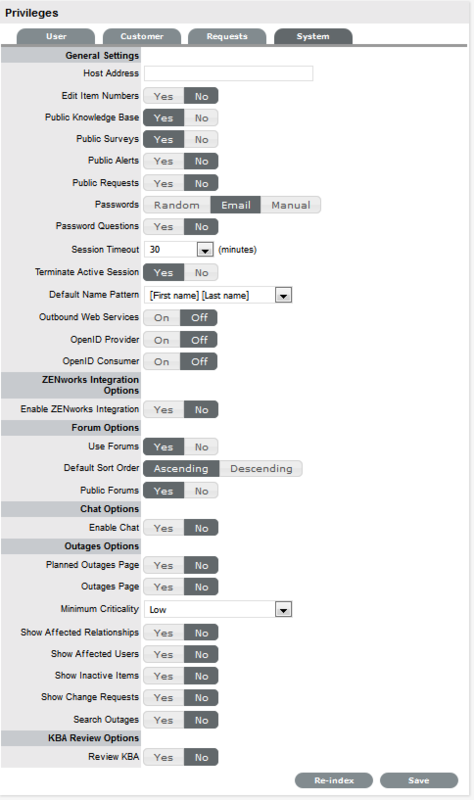 OpenID Providers that are to be used as delegates are configured in the Setup>Authentication>Social tab. This option enables and disables all Forums within the system. Sets the default Forum Topic sort order to either ascending or descending. This option enables Public Forums to be viewed from the login page and does not require an account to view. Select 'Yes' to activate Chat facility within the application. Set to Technician if Customers are to be restricted to chatting only with the Technician assigned to their Request. Set to 'Team' to allow Customers to chat with any member of the Team assigned to their request. Sets the default availability for chat status in newly created Technician Account information screens. A link to the Planned Outages page is displayed on the Login Screen. Outages can be set within Configuration Item properties to schedule when the item will be off-line. A link to the Outages Page is displayed on the Login Screen. Defines the Minimum Criticality required for Items to be displayed on the Outages pages. Enables Item from the Outages page to show the Item's Relationships. Allows Item owner's details to be displayed on the Outages page. Displays inactive Items on the Outages page. An inactive Item is an Item that is currently not in use by the organization. Allows Customers to view Change Requests related to Outages displayed in the Customer Portal. Enables Outages to be searched using the Customer email addresses or Item number. When enabled a Review date field is displayed in the KBA Information screen. The default number of days between reviewing KBAs should be set and the number of days before the review date for an Alert Reminder, should also be entered. NOTE:Note: All Outages options apply to Service Manager only. The Re-Index button at the base of the System Privileges page is used to re-build the system index. If the search engine appears to be failing text searches, this process will re-create the index. The indexing rebuild runs as a background process. Within the User tab, privileges for Users with the Technician and Partner Role can be configured by customizing the options within the Technicians options list. This also includes enabling functionality related to all User work hours and public holidays. Defaults can also be adjusted for Users across the Knowledge Management and Configuration Management processes. Create, edit, publish and delete Knowledge Base Articles by default. NOTE:Privileges assigned to the Technician Role are also applied to the Partner Role. The User tab is displayed. Allows Technicians to create Customer Accounts. Allows Technicians to reassign requests to another Technician within the same Team. When disabled, requests can only be reassigned through Escalation or changing the status of the request by the Supervisor. Allows Technicians to copy requests to fast track request creation. Supervisors have this privilege by default. Disables the timer that automatically monitors and records the time when a request is in Edit Mode. NOTE:This option is not available when Contracts are enabled in the Setup>Billing tab, as time worked on a request must be added to Notes manually by Users. Allows Technicians to view all the requests, regardless of Team assignment, logged in the system for the Processes they are assigned. It also allows Technicians to edit requests that are assigned to fellow Team members. Set to Yes to enable Technicians to add Notes to requests that are assigned a Workflow Exit State. Within the Items tab of a request, the All Items option is displayed in the Find Item box for Technician Users, if this option is enabled. By enabling this option, the "Include Global* Options" is ticked by default in the Find Item field, when a User is creating a request. To make the completion of the Subject field mandatory for Users during the request creation process, set the option to Yes. Allows Technicians to create system Alerts. Allows the Technician's availability to be configured within the Users>Schedule tab. This ensures that Requests are only forwarded to the User during the Defined Work hours, unless there are no other Users available. *If this option is enabled, the Users Work Hours must be defined for each User, otherwise the built-in technician assignment logic will be ignored and all new requests will be assigned to the Team Lead. When enabled provides the Assignment option within the User Information screen. This allows a Supervisor or Administrator to turn request assignment off for a User who is available in the system. Allows leave to be scheduled for Users, within the Users>Schedule tab. This allows vacations to be planned and automatically detected by the System when the User commences leave. The System will not assign the User new Requests when they are on vacation. This option becomes available when the 'Schedule Vacations' option is active. When enabled, this option ensures active requests of the User commencing leave are automatically re-assigned to available Technicians within the User's Team. This option ensures the System gives consideration to public holidays when calculating SLA times, escalations and breaches. NOTE:When enabled, the Public Holidays sub-menu option is visible within the Admin>Localization>Holidays tab. Allows Customers to be assigned to Partners within the Customer Information tab. Enables a Technician to create outages for Items. The system will propose relevant Solutions within the Analysis tab, during the request creation process. Set the default privileges for the User Roles' ability to create, edit and delete Item information in the CMDB. Configure the default Knowledge Base authoring permissions for each User Role. Customer Privileges specify the options that are available to Customers within the Customer Portal. The Privileges screen is displayed. Allows Customers to create their own account from the Login screen. Define the default setting for Web Access on newly created Customer Accounts. 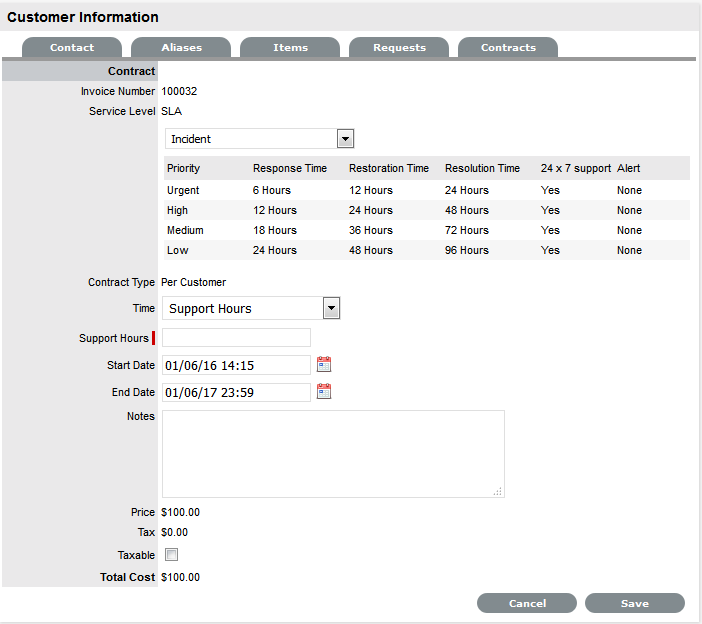 Define if Customers can view, create or edit Incidents in the Customer Portal. Define if Customers can view, create or edit Change Requests in the Customer Portal. Define if Customers can view, create or edit Service Requests in the Customer Portal. If the option to create Incidents in the Customer Portal is enabled, this can be refined by defining if Incidents can be logged against Service Items. If this option is disabled then Services are not displayed in the Category drop-down list during the Incident creation process. Also, if a Customer attempts to log an Incident against a Service via email by including the Item# in the Subject line, and this option is disabled, the system will send an error message. The "NoServiceIncidentContent" error message can be customized in the Admin>Setup>Email>Templates>Error Message filter. Define if Customers can view, create or edit their own Item details within the Customer Portal. Allows Customers to only view Items that are marked as Active in the system. Displays the Subject field above the Description field in the Customer Portal. Enables Customers to view and set the Priority of their requests. Alternatively, the Urgency can be shown, which will be associated with the Item Criticality to set the Priority. Select "Off" to disable this functionality completely. Allows Customers to search by an Item's ID when creating a new request. When enabled, proposes solutions for Incidents based on the Item Type, Classification and Description provided. 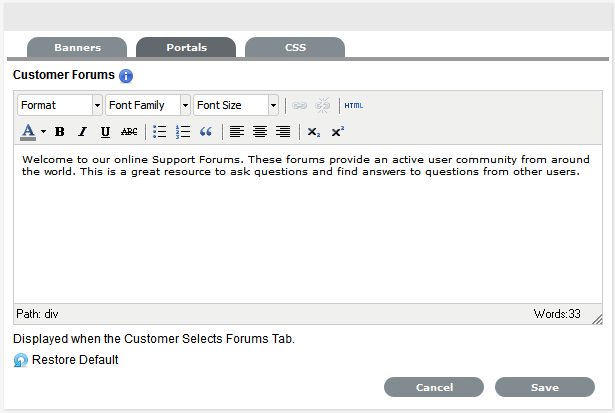 Allows Customers to create a new Forum topic through the Customer Portal. By default, supervisors with customer role have this privilege. Displays the Room for an Item when creating a request. Yes allows Customers to view the details of Technician assigned to their request in the Customer Portal. 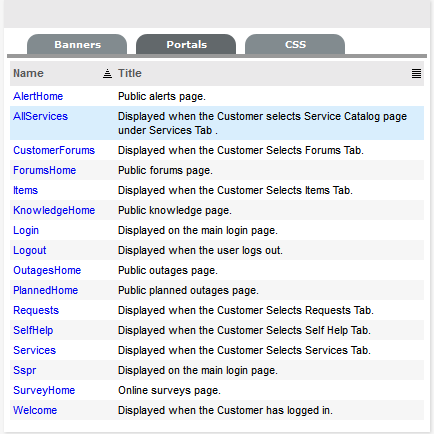 Enables the Service Catalog link in the Services tab of the Customer Portal. This allows Customers to view and log requests against all Services offered by the support organization (i.e., request access to a service). Services listed here are not assigned an Exit Item Lifecycle State. Displays the Response, Restoration and Resolution targets for the SLA assigned to the request in the Customer Portal. 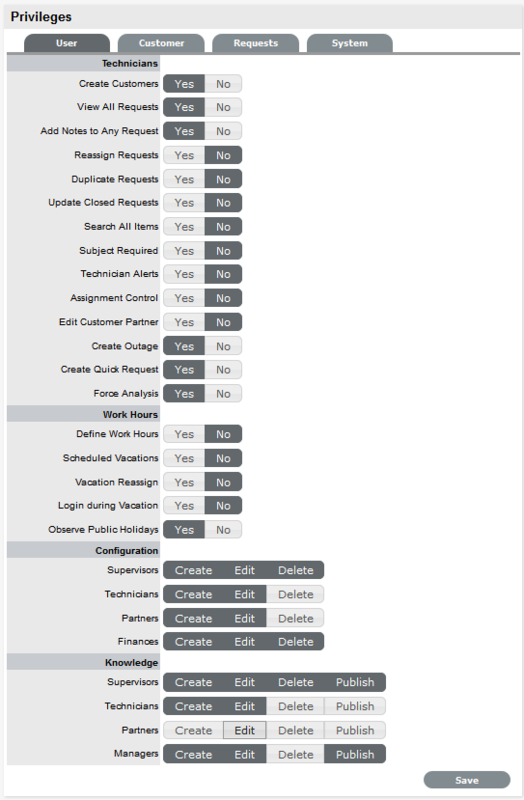 When enabled, provides the RSS Requests Menu option in the Customer Portal. When enabled, displays the Titles Tab within the Setup, which can be customized. This list is then displayed in the Title field in the User and Customer Information screen. When enabled, if requests are logged against an Item on the Customer Portal, Technicians can amend the Item assigned to the request without the Customer seeing the change. When enabled, this option allows the Customer to define their preferred method of contact in their Profile or My Account screen. Their preference applies when a Team has the Customer Notification option set to Customer Defined. When enabled, the Customer's GPS location when they last logged into the Customer Portal, is recorded within their Customer Information screen. Sets the default Date format to be used across the application. Set to Yes if the system is to import Customer details when synched with an LDAP/AD server. Allows Customer accounts to be created directly through the system, as well as being imported via LDAP/AD. Allows requests to be viewed by all Owners of the Item, when logged against a Shared or Global Item. Allows requests to be viewed by all Customers of an Org Unit assigned to the Item, when logged against a Shared or Global Item. Only visible to the Customer who logged the request. Visible to the Customer who logged the request and other Owners in the same Org Unit, assigned to the Item. Visible to Customer who logged the request and members of Org Unit they belong to, if the Org Unit is also assigned to the Item. Requests visible to Owners within all Org Units assigned to the Item. Visible to Customer who logged the request and other assigned Owners. Visible to Customer who logged the request, other members of the Org Unit the Customer logging the request belongs to and other Owners assigned to the Item . Visible to everyone who share the Item assigned to the request. Requests Privileges allows the Administrator to control the functionality available for requests and set default requirements. These privileges are applied system-wide. Enables escalation to be enabled or disabled on a per request basis. This option is only available to Supervisor Users. Allows Teams to use a holding bay for requests that are received via email or the Customer Portal. The Queues can be enabled within the Team Information screen, on a per Team basis. When enabled, Change Requests are automatically created from newly entered Deployments, and will require approval before work commences on the Deployment. When enabled, changes made within the CMDB by a Technician will generate a Change Request requiring approval before the change is implemented. When enabled, Customers creating Items via the Customer Portal generate a Change Request that requires approval before the change is implemented in the CMDB. Define the minimum degree of relevancy for content included in the Description field of a request, when the system automatically searches the Knowledge Base to propose solutions. 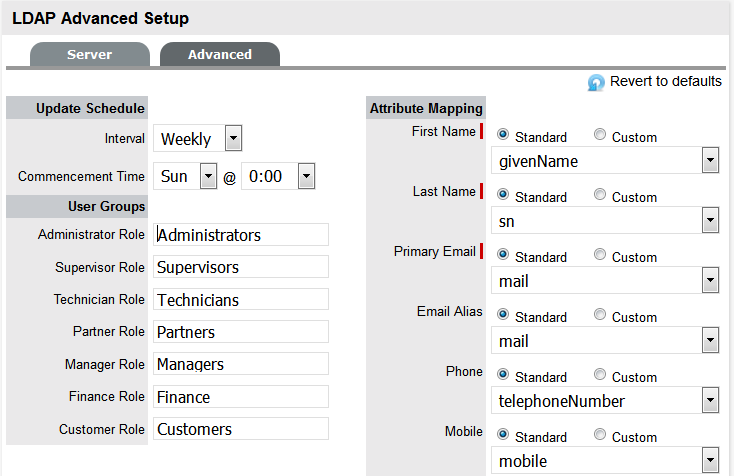 Enables the functionality that allows the Supervisor to profile Requests using Quick Call Templates. These can be used by other system Users when creating new requests. Enable Derived to allow the system to derive the Priority based on Urgency and Impact of the request . 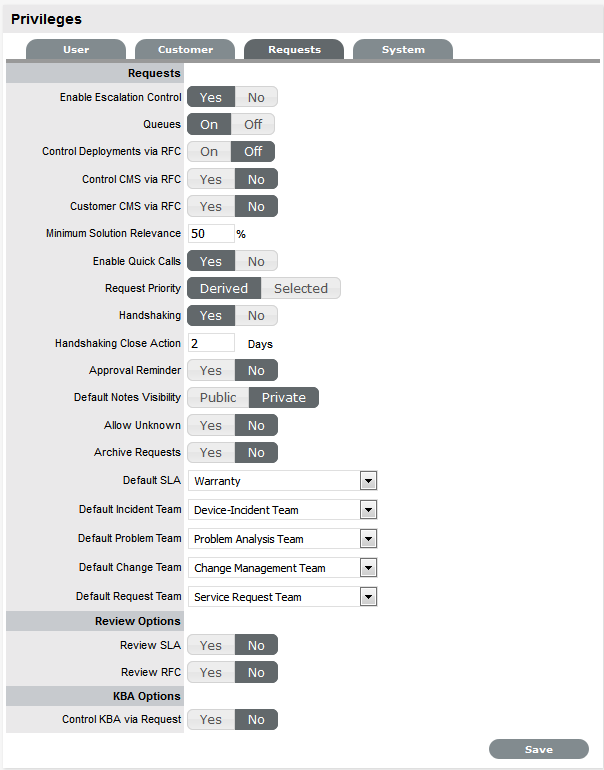 Enable 'Selected' to manually apply the Priority from a list of options. **This option is displayed when the Incident Priority is set to Selected. 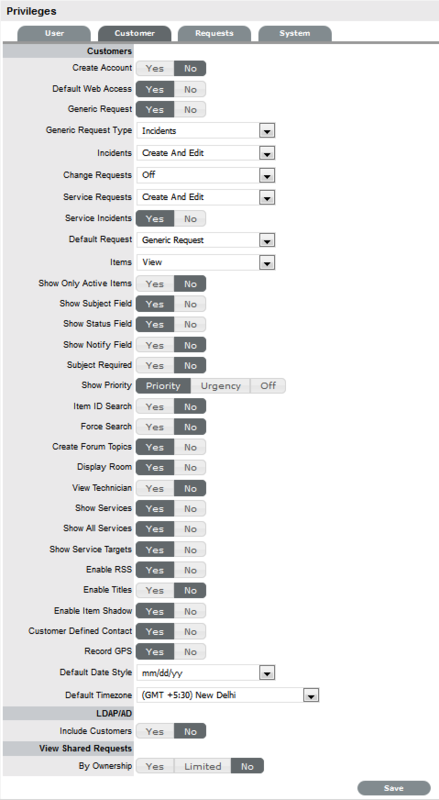 The selection made from the drop-down menu, is automatically applied as the default Priority for newly created requests. Enables notifications to be sent to a Customer using the Propose button within an Incident or Request, stating the Incident/Request will be closed if no reply is received from them within a set number of days. NOTE:Note: The Solution button within an open Incident/Request is not accessible when the Handshaking facility is enabled. When enabled, if Problems or Changes are closed, any related Incidents or Requests are moved to the Pending - Approval State not to the default Closed State. Sets the system default number of days to lapse before an Incident or Request will close if the Customer does not respond to the handshake email notification. This can be adjusted on a per Org Unit basis. NOTE:Note: To allow Customers to re-open an Incident or Request using the link in the handshake email, the web server must be using Port 80. To automatically send Managers reminder emails regarding Requests requiring their approval, set this option to Yes. When Yes is selected, define the number of days to lapse before a reminder will be sent. The content of the reminder email is drawn from the ApproveChange or ApproveServiceRequest template. These are configured within Setup>Email>Templates tab. Sets the system default visibility of Notes, when added to requests. If it is expected that the majority of Notes are to be emailed to Customers, select Public. When set to No and a User opens a request that is assigned the Unknown Service Item, the User will be prompted to update the Item before saving the request. When enabled, the number of days a request is closed before being removed from the List View and archived is to be set. Requests that are archived have attachments removed and they are no longer included in the full text index for searching. They are still accessible for reporting purposes and attribute based searches. Is used as the Default SLA when a new request is created without an SLA defined for the Item, Customer or Org Unit. 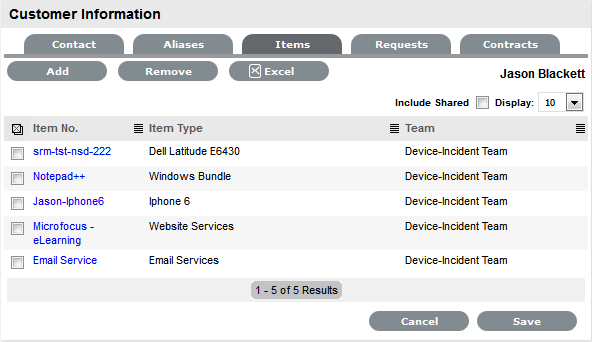 Set the Default Incident Team, which is used for AMIE integration and also set as a default Support Team for Item Types. Set the Default Problem Team, which is used for AMIE integration and also set as a default Support Team for Item Types. 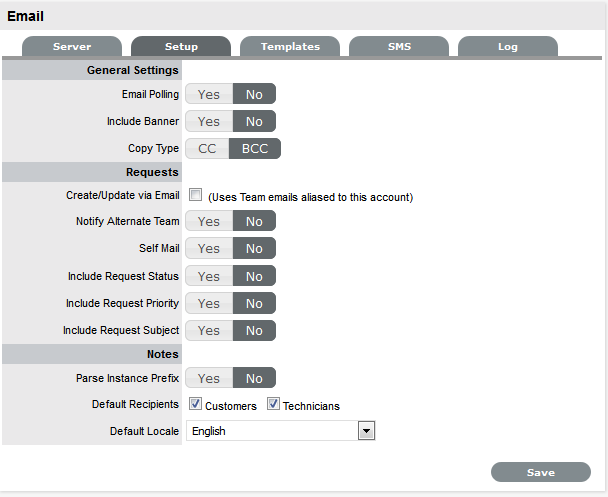 Set the Default Change Team, which is used for AMIE integration and also set as a default Support Team for Item Types. Set the Default Request Team, which is used for AMIE integration and also set as a default Support Team for Item Types. When enabled will display the Review date field in the Service Level Information screen. The default number of days between reviewing SLAs should be set and the number of days before the review date for an Alert Reminder, should also be entered. When enabled the system will display a Review date in the RFC Information tab. The default number of days between reviewing RFCs should be set and the number of days before the review date for an Alert Reminder, should also be entered. When enabled, a Request is generated when the KBA is created, deleted or amended and can only be published to the KB by a User with publishing privileges. Specify the type of request to be generated when new or amended KB content is moved to a "Pending Publication" state. Set the default SLA to be used for when requests are logged regarding updates in the knowledge base. Applying an SLA here, determines which workflow and team will receive the requests for approval, as with any other request logged in the system. * To be set after Teams have been configured. The Customize menu allows the Administrator to brand the application where system banners can be replaced with the appropriate organizational banners. Graphics included should be . PNG images. The Application Banner should be 200 x 60 pixels and all other banners should be 500 x 70 pixels. Visible on the Log in page of the system. Displayed on public portals for Knowledge, Outages, Surveys and Forums. This banner is also included in emails when the Setup>Email>Setup option of Include Banner is set to Yes. Visible in the Customer Portal. NOTE:Banners for Partner Organizations can be uploaded in the Banners tab of the User>Partner Organization screen. This will override the system Customer Portal banner for Customers associated with the Partner Organization. A window with a browse function appears. The image will be uploaded. NOTE:When the Purchase Orders functionality is enabled within the Setup>Billing tab, the option to upload a logo that will be used for system generated POs is displayed. The graphic should be saved as 150x150 PNG file. NOTE:Outage Home and Planned Home Messages apply in Service Manager only. The CSS tab allows Users to customize the look and feel of banner backgrounds and tabs within the system. Knowledge of working with cascading style sheets is recommended when making changes to these settings. This controls the style of the customized banner on the Login page. This controls the style of the default banner on the Login page. This controls the helpdesk icon graphic on the Login page. This controls the style of the customized banner within the User portal. This controls the style of the default banner graphic within the User portal. This controls the style of the customized banner within the Customer & Public portals. This controls the style of the default banner within the Customer & Public portals. This controls the highlight on the active (main) menu selection. This (in tandem with the span extension) controls the mouseover (hover) on the submenu tabs. This (in tandem with the hover default above) controls the mouseover (hover) on the submenu tabs. This controls the highlight applied to the selected submenu options. If unwanted changes are made to the system Style Sheets, use the Default button to return the system to the out-of-the-box format. There are several ways to authenticate users of the service management application. By default the system uses its internal authentication mechanism but there is also the option to authenticate against one or more Directory Servers or use OpenID Providers. OpenID is a decentralized process to verify a Customer's or User's online identity. It addresses the single sign-on issue by not relying on a centralized website to confirm a User's identity. The system can be enabled to be an OpenID consumer, which provides seamless authentication between third party authentication utilities and the service management system. OpenID Providers are configured within the Social tab, and Customers or Users that have accounts with the configured OpenID Providers can log into the system by selecting the relevant icon on the Login page. Roles are used to grant access within the application. Users must be assigned to Groups on the directory server that correspond to the Roles within the support system. Group members are assigned Roles and access levels within the service management tool. The Group names can be customized in the LDAP/Active Directory Advanced tab. Users can belong to more than one group, for example if a User holds the Roles of Technician and Manager, they would belong to the Technicians and Managers groups. NOTE:Users can have only one of the Partner, Supervisor and Technician Roles. Therefore, they can belong to only one of these groups. However, they may also belong to any other group, or combination of groups. All User accounts must include an email address to be successfully imported into the system. If additional fields have been mapped from the authentication server to corresponding fields in the application, a drop-down menu containing all the optional values for the field will be available beside the mapped field. Choose the correct value from each list. The application can use a combination of internal and external authentication. This means, the service management tool can be synchronized with a Directory Server to import User and Customer details as well as allowing Customer Accounts to be created directly within the system. Such a feature is useful, if the service and support solution is being used for internal and external customer support. To enable Mixed Mode authentication, after the system has connected to the Directory Server, move to the Setup>Privileges>Customer tab and enable the Include Customers option to display the Mixed Mode field. Set the Mixed Mode option to Yes. NOTE:If authenticating against a Directory Server, all User accounts will validate against the server except for the application default Administrator User. The default Administrator User account details can be modified within the My Account tab of the application. It should, however, be noted that LDAP does follow a standard and as such the settings detailed herein should also apply to other implementations. The LDAP /Active Directory Server tab is displayed. Secure Socket Layering (SSL) encryption is provided for Active Directory and LDAP server integration. Details entered here determines how the integration layer authenticates. User authentication can be with Secure Socket Layering (SSL) or Clear Text. Select Anonymous or User name and Password. If Anonymous is selected, ensure anonymous access to the directory is available. 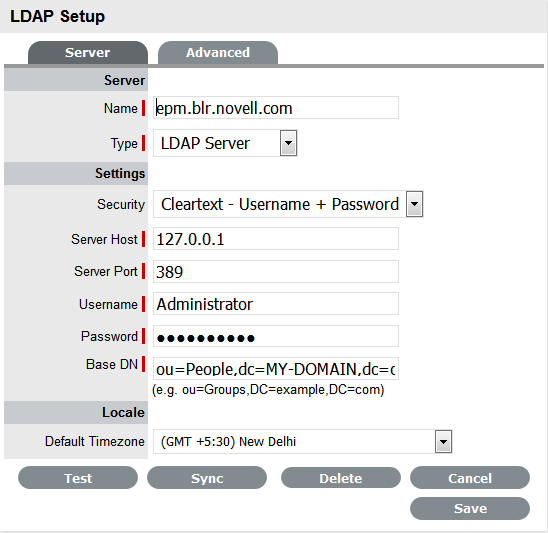 Enter the host name or IP Address of the LDAP Server. This is the LDAP Server Port. The default is 389. The system authenticates the user name against the LDAP Server. Leave this blank for anonymous connections. Where a user name is provided, Netscape allows the internal users to connect as the account name, so using ‘cn=Directory Manager’ is acceptable. Open LDAP expects the fully qualified Domain Name for the user, regardless of access level, so at the very least ‘cn=Manager,dc=example,dc=com’. For other accounts the user BaseDN is required. Users logging in need only enter their login name, it is assumed the login name will be unique across the entire directory. If a User account is specified in the User name field, enter the account password. The above String would be the BaseDN. Select the default Timezone to be applied to all User accounts imported using the authentication server. The Test button will create a connection to the LDAP Server using the configuration settings. If successful, it will attempt to determine how many Users are in the top level of each group and display a Results screen. The Synchronization button runs the synchronization process manually. It is most useful for the initial deployment, and when new directory server accounts have been created for Users who require immediate access to the system. If using Certificates ensure the certificate details are entered in the Certificates tab before synchronizing. Only one synchronization can run at a time. For multiple users needing access, create the accounts on the LDAP server then run a single manual synchronization. A manual synchronization may take some time as it depends on the connection speed with the external service. The manual synchronization works best for small directories, as larger directories take more time to propagate changes. Customer details can be imported using LDAP by enabling the option, if required. When the system is setup to synchronize with LDAP, move to the Setup>Privileges>Customer tab and enable the Include Customers option. If there is a need to create Customers using LDAP and the system's internal authentication capability, Mixed Mode authentication can also be enabled. After the option to Include Customers is set to Yes in the Customer Privilege tab, the Mixed Mode field is displayed. Set this option to Yes to allow Customers to be created directly in the system and using LDAP. A list of Classifications used to define issues are created within this tab and used as the generic Classification for requests logged against Items that apply the Item Type Category being configured. The Classifications are also used by the system for proactive Incident analysis and Problem groups. Supervisor Users can define additional Classifications for specific Item Types, within the Configuration>Categories>Item Categories>Classification tab. The system is installed with several default Classification Type Categories, which can be edited if required. NOTE:The General Classification is owned and used by the system and cannot be deleted. It is also advised that this Classification not be renamed, as this is the Classification assigned to requests when they are created via email. Additional Classifications can be created for each Item Category, while the system provided Classifications can be renamed or deleted. The Custom facility, when enabled, allows Users to add Classifications during the request creation process. Select the entry, then drag and drop the entry into its new location. Classifications can be expanded to include nested Classifications. 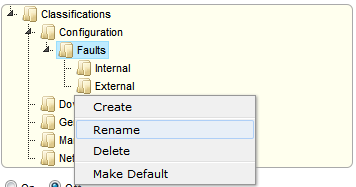 The Create, Rename, Delete and Make Default options are displayed. A text box will appear under the Classification. The above steps can be repeated until the sub-category list is completed. Any Item Category classification can be renamed. Click away from the text field to save the change. Click Done when the Classification Categories are complete. Within the CMDB Import screen multiple asset management datasources can be synchronized with the service management system. When one or more applications are configured within AMIE, a list is displayed within the AMIE Setup tab. The Server, Database, Ownership and Synchronization fields appear. Define the system type as Database Mapping. An identifying label that is used in List Views to inform Users regarding the Source of an Item. Select the Type of inventory management product. Enter the Host name or IP Address. Enter the Port Number for the database server. Enter the Catalog name. Typically this would be the name of the Database. Select this option if technicians are to be notified of generated change requests. Select this option if Items are to be globally owned. Select this option to assign imported Items to the System User. Select this option to assign imported Items to a specific Customer. Tick this field if the system is to disregard domain details attached to the User Name inside the AMIE source when assigning an owner. This option is only visible when a single AMIE source is defined within AMIE. When enabled, Items are automatically created upon synchronization, relative to the Control CMS via RFC setting within the Setup>Privileges>Requests tab . If disabled, a snapshot of imported asset information is listed within the Super>Configuration>AMIE Snapshots tab. Choose a synchronization interval. This can be left as Never if the database will be synchronized manually. NOTE:Synchronization times will vary depending on the connection speed with the external service and the database size. If a connection is not made, a system message will advise which part of the configuration was not successful. After the import is complete, an Alert appears providing results of the import. Click on the Publish link to read the Alert details. the details of the system that the synchronization was run against, as it is possible to import from multiple sources. the number of assets found in the datasource. the number of assets automatically created if a single datasource is configured in AMIE and the auto-create option is enabled; or if the Auto-Create option is disabled and Items already exists in the system, the number of Items that were updated. the number of AMIE Snapshots successfully imported, with a breakdown of new Items added and number of Items updated. The options to delete AMIE configurations can be achieved through the List View on the AMIE Setup tab, or by clicking on the a hyperlink within the Server column within the List View, which displays the expanded Setup view for the specific asset management tool. The Delete button clicked in the AMIE>Setup tab>List View results in Global level "delete" flags being applied to all AMIE-managed Items stored in the system, however it retains the server details configured in AMIE and their associated snapshots. The imported Items that are deleted are not completely removed from the database but are flagged as not available . By not erasing the Items completely, the historical data is maintained and allows these Items to be re-enabled in the future. It should be noted that the Item Types associated with the deleted imported Items are not disabled in the application. The Delete button selected within the expanded Setup tab view for the specific asset management datasource, results in Configuration level deletion of the configured server and any related AMIE snapshots. NOTE:The application must be restarted after the performance of either deletion operation, to allow the changes to take effect and prevent unpredictable behavior of the system. The expanded Setup screen is displayed with the Delete button. A pop-up message is displayed asking your to confirm the deletion action. A warning message is displayed informing you to restart the application server to complete the deletion process. 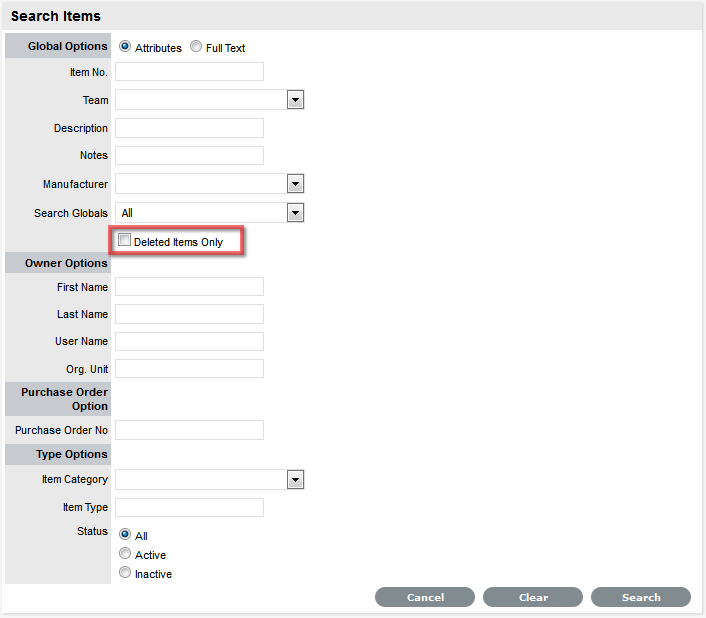 To re-enable Deleted Items, initiate an Item search on deleted Items within the Configuration>Items screen of the Supervisor view. A list of Items is displayed. 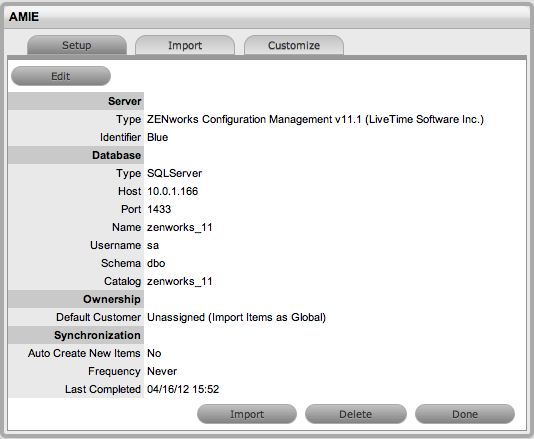 NOTE:Service desk now uses service name of the Oracle database configured with ZENworks. While using the Oracle database, if you are unable to connect to ZENworks, see ZENworks Core Admin for the service name. To import Items using a .CSV file, a .CSV template, containing all available fields, can be downloaded and populated. 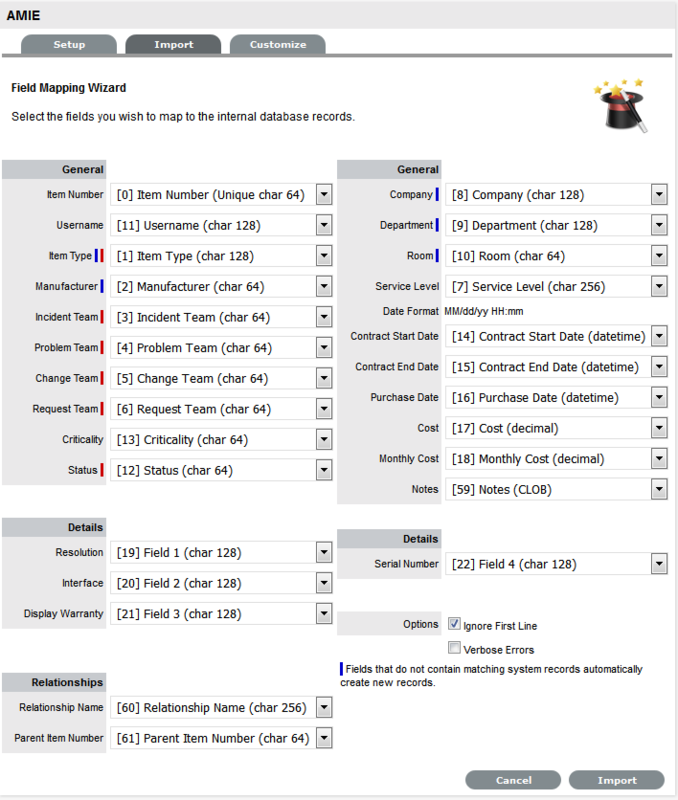 The service management system uses a field mapping Wizard to match fields in the template to those in the system. To download the template go to Setup > Item Import > Import. See Downloading an Item .CSV Template for more information on configuring the .CSV file. The Teams within the .CSV file must be created in the system before they can be associated with an Item as part of a .CSV import. Teams are created by a Supervisor under the User>Teams tab. Items are imported based on Category (i.e. Hardware, Software, etc. ), which must be configured by the Supervisor within the Configuration>Categories tab before conducting a .CSV import. The Categories configuration defines the Details recorded in the Item to be imported into the system. The Administrator must create separate .CSV files based on the Categories configured, that are then individually uploaded into the application. For Items imported with owners, the Username in the .CSV file must match the Username within the support system. If the owner does not exist in the system, the imported Item will become a Global Item. NOTE:If relationships are to be created between Items upon import, Parent Items should be imported first. If the system generated Item Number is to be used for the Parent Item, it needs to be included in the Parent Item Number field of the Related Items when they are imported. To access a template that illustrates the fields the application maps and the data types (see below), click the Download Template link on the Item Import Wizard screen within the Setup>AMIE>Import tab. Item Type (char 128) means that the first name field cannot exceed 128 characters. Fields marked as Unique must be unique in the system. When creating a .CSV file for a Category, to determine the Field number of a configured Custom Field, within theCategory tab of an Item Category select the System defined Ordering option. The field labels will then be listed in sequential order from one to twenty. The drop-down list consists of all Categories created by the Supervisor in Configuration>Categories. The Field Mapping Wizard appears. Fields that can be mapped to the CSV file are available in the drop-down list. Unique Item number of the Configuration Item, this can be generated by the system or defined in the .CSV file. Customer owning the Configuration Item, imported by entering their user name. Item Type of the Configuration Item. Sets the manufacturer details of the Item. Incident Team assigned to the Configuration Item. Problem Team assigned to the Configuration Item. Change Team assigned to the Configuration Item. Sets the default Criticality (i.e, critical, high, moderate, low, very low) for the Item. Optional. Company owning the Configuration Item. Department owning the Configuration Item. Displays the date format required for the contract details to be imported successfully. Sets the start date of a contract associated with an Item. Sets the end date of a contract associated with an Item. Date the Item was purchased. The cost of the Item. Sets the monthly Service Cost on per month basis for the Item. Free text to add notes to the Item. Optional. Custom fields created for the Category are displayed and can be mapped to the Item based on information included in the .CSV file. Defines the description of the relationship between the Item set in the following field. Identifies the Item with which an Item is related using the Item Number. Option to ignore first row upon import. Detailed description of any errors that occur during the import process. Leave the checkbox clear if the CSV file begins with usable data. Leaving the box unchecked will return a summarized error report. The Item Import screen displays the results of the import. After an import, all Item Types that have been created will need to be further configured. The Type Information screen appears. Name of the Item Type. The manufacturer of the Item Type. New manufacturers can be created and existing manufacturers can be edited and deleted by using the Edit and New buttons that appear beside the drop-down menu of manufacturers. This signifies the type of Item. (Hardware, Software or Service are the default Types, but Users with the Supervisor Role can create more if required). The drop-down list that appears is drawn from the fields defined for the Item Category selected. Although this information is not required, the Identifier is used to differentiate similar Items that may be in use throughout an organization. For example, if an organization uses the same printers for all departments, an Item Category field of "Location" could be configured for the Item Details and this could also be used as a secondary Identifier for Printer Item. Rates the degree of importance of an Item Type within an organization, which can be adjusted on a per Item basis. The 'Impact' of a Request is initially pulled from the Criticality of the Item, but can be adjusted within the request Information screen if required. Requests logged through the Customer Portal, use the Criticality of the Item to set the Priority of the request. The Incident Analyzer, if enabled by the Administrator in Setup>CMS>Incident Analyzer, can apply the Criticality to automatically detect Problems. The minimum Criticality level can also be used to determine the off-line Items that appear on Outages pages, if the Outages pages are enabled by the Administrator in Setup>Privileges>System. When the Type details are saved, the Icon selected for the Item Category will be displayed. To customize the icon for the specific Item Type, select the Icon to access the Upload or Cancel options. The per-unit price of the Item Type. Number of instances owned by the organization. Number of instances assigned to Customers as Items. Select 'On' to ensure Customers cannot view this Item Type within the list in the Customer Portal. If all Item Types use this selection, the Item Type list will be completely removed from the Portal. Items created using Item Types with Hidden enabled, will not allow Customers to generate requests against them in the Customer Portal, nor will they be able to view or receive updates about requests logged by the User against Items with this functionality enabled. Enabling this option overrides the system level option for sharing requests raised against Items of this Type. Requests raised against Items of this Type will not appear in the customer portal when viewing shared requests is enabled. Create a forum topic using the Item Type Name. This option is only displayed when a new Type is being created. The default service level for the Item Type. When Billing is enabled, service levels without a cost are listed as an option. The service level with an associated cost can be applied when the Item created, this ensures Item contract payment is processed. All Service Level Agreements assigned to the Item Type, which will be displayed as options when a request is created applying Item that uses this Type template. SLAs listed here, are used within the Costs tab of Service Types to forecast break even points on the Service relative to the number of Users. To assign multiple SLAs use this option. Click to view all SLAs or refine the search by entering a specific name. Select the SLA hyperlink to assign the SLA to the Type Information. Click to clear the search field. Move to the Classification tab to create problem classification for this Item Type. Click on the Item Type name to continue configuration. The .CSV file import facility can also be used to assign more than one Company and Department to an Item, if required. To assign multiple companies within the Company column of the .CSV file, enter the company names separated by a semi-colon (;) If the Company or Companies do not exist in the system, or have been deleted, a new Company will be created. Any departments that do not exist in the database or have been deleted, will be created as a result of the .CSV import. To easily update multiple Items that already exist within system, information can be imported using a .CSV file. For the update to be successful, the Item number in the .CSV file must match the Item number in the system. Follow the above Importing Items procedure and ensure the Item Number field is mapped correctly. If an Item Number is not included in the .CSV file, a new Item will be created. To view a template that illustrates the fields the application is looking for and the data types (see below), click the Download Template link on the Item Import Wizard screen within Import tab of Item Import in the Setup tab. Select the Ignore First Line checkbox if the first line of the imported CSV file has field headings. Leave the checkbox clear if the CSV file begins with usable data. Leaving the box unchecked will return abbreviated errors.